After re-assembly the static run-out of each spindle is checked using a precise gauge pin and dial indicators before bringing the spindles up to speed. Excellon's New Spindle Repair And Exchange Service Is A Whole Lot More Than Just Spindle Repair! You Can't Afford To Trust Your Spindle Repair To Anyone Else! Pull testing is done on each spindle using calibrated weights and pneumatics to assure the collet holds tools securely in place. Excellon warrants the spindles to be free from defects in material and workmanship for the period set forth above for the specific spindle. The sole responsibility of Excellon under the foregoing warranties shall be, at its option, to repair or replace any defective part or component which fails during the warranty period, Ex-Factory. Replacement parts will be furnished on an exchange basis, and will be either new or certified replacement parts. The foregoing warranties do not extend to disposable parts and components supplied for use, including but not limited to collets. Spindle damage caused by accident, neglect, misuse, air conditioning, humidity control, failure of electric power, failure to comply with applicable operating instructions. Spindles that were damaged as a result of a collet that is not authorized by Excellon or not supplied by Excellon, or if such a collet were in use when the spindle was damaged. Any equipment or part that has been disassembled or dismantled. Any equipment not installed in compliance with the appropriate installation specification. Any other cause than ordinary use. The foregoing warranty is exclusive and in lieu of all other warranties or conditions, expressed or implied (including any implied warranty of merchantability or fitness for particular purpose). Repair or replacement in the manner provided above shall be the sole and exclusive remedy of Purchaser for breach of warranty and shall constitute fulfillment of all liabilities of Excellon with respect to the quality and performance of the spindle. Excellon shall not be liable to Purchaser, whether in contract or in tort (including negligence and strict liability), for loss or damage to property of Purchaser or others, loss of use, loss of revenues or profits, or for any special, indirect, incidental or consequential damage whatsoever. Free Same Day Shipping for All Spindle Exchange! You Can’t Afford To Trust Your Spindle Repair To Anyone Else! 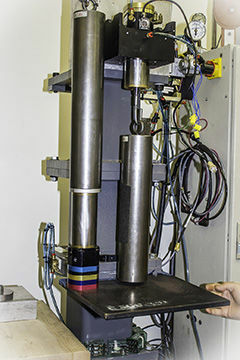 Sophisticated equipment is used to test and calibrate the high speed run-out of each spindle armature prior to reassembly. Once work on the spindle has been completed dynamic vibration and run-out measurements are taken to verify that the spindle exceeds the manufacturer's standards for performance in these areas. What spindles do you repair? Our OEM certified, factory trained technicians repair all Westwind Air Bearing spindles used on Excellon drilling and routing machines, including: 80k D/R, 110k, 125k, 170k, and180k spindles. We also repair Excellon Ball Bearing spindles including: 420, 820, 880 and 1010 models. How do I send my spindle in for repair? You can call Excellon parts department @ 1-800-EXCELLON to obtain an RMA # before you send your spindle in for repair or you can just send your spindle to Excellon, Attn: Spindle Repair. If you previously had a spindle repaired by Excellon you may use the pre-paid UPS shipping label that was included in the box when we returned your spindle. The cost to repair each spindle is determined by identifying what parts are damaged and needs to be replaced to ensure your refurbish spindle meets or exceeds the original factory specifications. Prior to Excellon beginning a repair, you will receive an evaluation and quote. 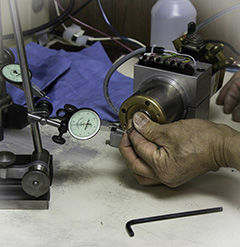 We make every effort to complete a spindle repair and return it to you as quickly as possible. We strive to complete all evaluations and provide you with a written evaluation and quote within 2 days of receiving the spindle. We make every effort to have the repair completed and shipped within 1 week of receipt of your defective spindle. If I need a replacement spindle immediately, what do I do? If you need a replacement spindle immediately, we offer our spindle Express Repair program where we can ship a replacement spindle, usually same day, and evaluate your damaged spindle to determine the cost of the repair. Call Excellon customer service to take advantage of the Express Repair program. We provide an extended 180-day warranty on ALL of our refurbished spindles that cover failures due to parts and workmanship. Please refer to the Excellon Standard Warranty on our web site for more details. How do you ensure the quality of your spindle repairs? All spindle repairs are performed by our OEM certified, factory trained technicians following our 70-point quality certification process. We back our exceptional work with a 180-day warranty on ALL our refurbished spindles. We refurbish all spindles to meet or exceed the original factory specifications. Why are your repairs more expensive than some others? In a word QUALITY! 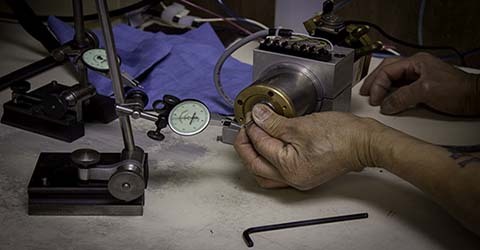 Our OEM certified technicians complete ALL repairs using ONLY OEM Certified parts. We use a 70 point quality certification process to ensure your refurbished spindles will meet or exceed the original factory specifications. We also take the extra steps like replacing all o-rings on your spindle to increase the life and performance of your repaired spindle. We are so confident in our quality that we offer our extended 180-day warranty on each spindle. What other service do you provide with the spindle repair? A written, detailed quote and analysis of your spindle will be provided to you after your spindle has been evaluated. All refurbished spindles meet or exceed the original factory specifications. Complete replacement of all o-rings with each repair. Drawing upon our deep knowledge of Excellon machines we can also recommend machine adjustments or repairs to help extend spindle life. We have a vested interest in keeping Excellon machine performance up while keeping the Cost of Ownership down. Why should I use Excellon’s spindle repair service? Excellon provides the highest quality repair work from our OEM certified, factory trained technicians who use ONLY OEM Certified parts. Excellon refurbishes your spindle to meet or exceed the original factory specifications and backs this work with a 180-day repair warranty and intimate knowledge of the Excellon machines. 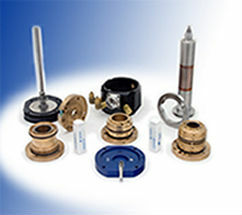 Our goal is to offer you the highest quality spindle repair in the industry at the most affordable cost. We also draw upon our deep knowledge of Excellon machines we can also recommend machine adjustments or repairs to help extend spindle life. We have a vested interest in keeping Excellon machine performance up while keeping the Cost of Ownership down. How do I know what was wrong with my spindle? After the evaluation of your spindle, we will provide you a firm quote with detailed information including a detailed failure analysis, parts needing replacement, notes from our technicians about your spindle repair and expected repair time. How do I know what you replaced/repaired on my spindle? After the evaluation of your spindle we will provide you a firm quote that includes a detailed failure analysis and a list of parts needing replacement. We will also replace several other parts as needed, including all o-rings that will not be detailed on the quote. The cost for these other replacement parts is included in the standard Spindle Repair service charge. Do you charge an evaluation fee? What type of training have your people received in spindle repair? Our technicians have extensive factory trained experience and are OEM certified. Their vast knowledge of Excellon machines and spindle repairs gives our customers the advantage of receiving the highest quality spindle repair in the industry. Can you repair spindles from non-Excellon machines? We have chosen to focus our expertise of the Excellon equipment by repairing only spindles from Excellon machines at this time. Does the free same day shipping with spindle exchange also cover the cost of sending the core back to you? Our free shipping applies ONLY to the replacement spindle being shipped to you. If you are ordering other parts with the exchange spindle we will deduct the shipping cost of the spindle from the total shipping cost on your invoice. How much credit do you provide for a returned core? Call Excellon customer service or check Partlink on our web site for core values by spindle model.